Watch the Hizbul terrorist confess to his crime in police custody and how he was instructed to blow a CRPF bus in Ramban's Banihal. New Delhi: Jammu and Kashmir Police on Monday arrested the accused of the car blast near a CRPF convoy earlier on Saturday in Ramban’s Banihal area. Addressing a press conference, DGP of Jammu and Kashmir Police Dilbagh Singh said that Owais Ameen, the accused, confessed to his crime during interrogation and is associated with the Hizbul Mujahideen. “The accused Owais Ameen has been arrested within 36 hrs of the incident. During interrogation, he confessed to the crime. He is a resident of Shopian,” Singh said. 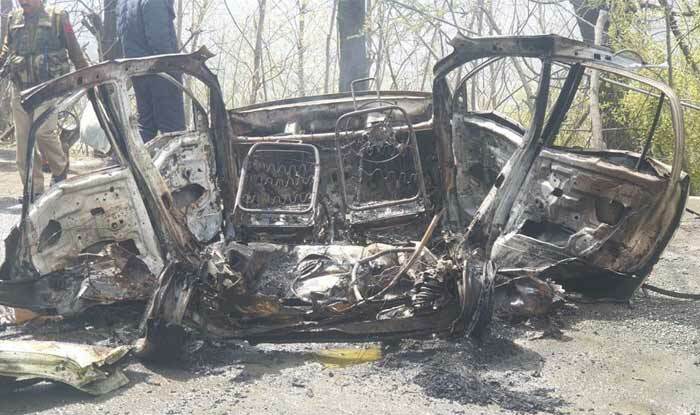 DGP Singh told reporters that a Santro car loaded with explosives hit a Jammu-bound CRPF bus on Saturday at 10:15AM shortly after it crossed the Jawahar Tunnel and then burst into flames. The CRPF vehicle suffered minor damages and all the personnel escaped unharmed. DGP Dilbagh Singh said Owais hid in the bushes for some days before coming out and hailing a ride to Kashmir. He was apprehended by a joint team of the Indian Army and the Jammu and Kashmir Police standing guard at a checkpoint. DGP Singh added that the forces were able to recognise him due to his injury marks and the intel inputs sent to them post the attack. “The inspection of the vehicle and surrounding areas led to the recovery of LPG cylinders, a jerrycan filled with petrol, gelatin stick, urea and sulphur — material which is used for fabricating the Improvised Explosive Devices (IED),” police told PTI earlier. The incident comes less than two months after Pakistan-based terrorist organisation Jaish-e-Mohammed (JeM) orchestrated a terror attack in south Kashmir’s Pulwama on February 14. An explosives-laden car rammed a CRPF bus and blew it, killing all 40 personnel onboard.